The Ursuline Sisters (aka “The Ursulines”) were founded by St. Angela Merici in Brescia, Italy in 1535. St. Angela’s vision offered a new kind of religious life for women to dedicate their lives to God and to the service of others while living among the people. 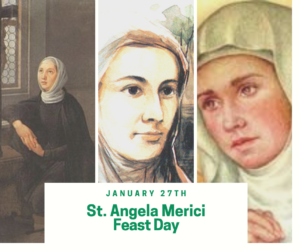 This new company of women, placed by Angela Merici under the special patronage of St. Ursula, spread throughout Europe and eventually to the New World. The Ursulines established a strong identity as educators and founded communities and schools throughout the world. They were pioneer educators in North America – Canada in 1639 and New Orleans in 1727. Many other educational institutions were established throughout the United States and Canada. In that same tradition, the Ursulines of the Eastern Province today serve in four states, in educational ministries that include colleges, secondary schools, and parish schools. They bring the richness of the Ursuline tradition of education to these institutions. As times have changed, the Ursulines have broadened their ministry to include the arts, parish work, chaplaincy, counseling and spiritual direction, as well as law, corporate responsibility work, health and hospice care, service to the aged, homeless, and advocate for the victims of human trafficking. As members of the Roman Union, a branch of the worldwide family of St. Angela Merici, the Ursulines of the Eastern Province also serve in other parts of the world. Today there are Ursuline Sisters serving on six continents.